14 years ago, on 4 March 1999, the front cover had an entirely different message. Then, the editors of the Economist published an article titled, “Drowning in Oil.” They wrote that “The world is awash with the stuff, and it is likely to remain so.” They thought that cheap oil from the Middle East would reduce the then price of $10 down to $5 per barrel. One year earlier Colin Campbell and Jean Laherrere wrote in an article in Scientific American that cheap oil would reach peak production in around 2004 (read the article). It was the flow of this cheap oil that, according to The Economist, would force the price down to $5 per barrel. We now know that according to the International Energy Agency (IEA) cheap oil reached maximal production in 2005 and the shortage of cheap oil subsequently forced the price up to over $100 per barrel. On the 3rd of August 2013 the next issue of The Economist will have a front cover showing a dinosaur holding a dripping fuel bowser nozzle. It is interesting that the Economist should choose this image since in my book, “Peeking at Peak Oil” we describe how the greatest amount of oil was formed during the same period that the dinosaurs roamed the Earth. 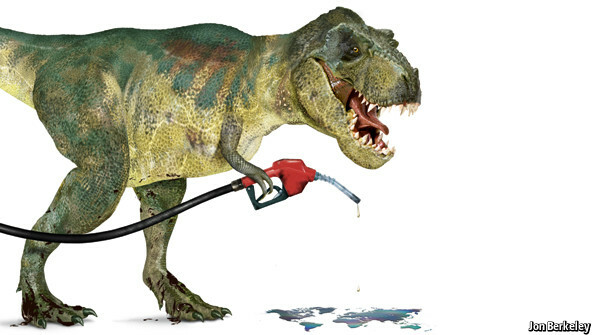 When we began writing the book we also had a dinosaur to symbolize “Peak Oil” and the image on the front cover of The Economist gives me a reason to show you this depiction. The Economist does not believe that a shortage of oil is causing the stalling of production growth. “This is not the “peak oil” widely discussed several years ago, when several theorists, who have since gone strangely quiet, reckoned that supply would flatten and then fall.” The reason why The Economist believes that we in ASPO, The Association for the Study of Peak Oil and Gas, are silent is that leading newspapers such as Wall Street Journal, New York Times, The Guardian and The Times no longer accept our articles for publication. We have no wealthy oil companies to back us. Instead, what we have seen in the past half year is that everything in the press has focussed on how “fracking” will solve all our problems. Personally, last year I published “Peaking at Peak Oil, ” and I encourage the editorial staff of The Economist to read it as a counterweight to all those articles that say we have nothing to worry about. The Economist’s comment, “in the rich world oil demand has already peaked: it has fallen since 2005” is interesting and should be explained. Figure 19.3 in my book shows that the volume of oil available for export reached a maximum (i.e. a peak) in 2005. Since then the world’s wealthier nations have seen consumption (or “demand”) fall. The fact that the oil price rose from $10 per barrel in 1999 to over $100 today should give every faithful economist reason to believe that we are now experiencing an oil shortage. It is my hope that the article in The Economist will reactivate the Peak Oil debate.